Mowing at our place can be a burdensome task, as we have a lot of ground to cover, especially this time of year. 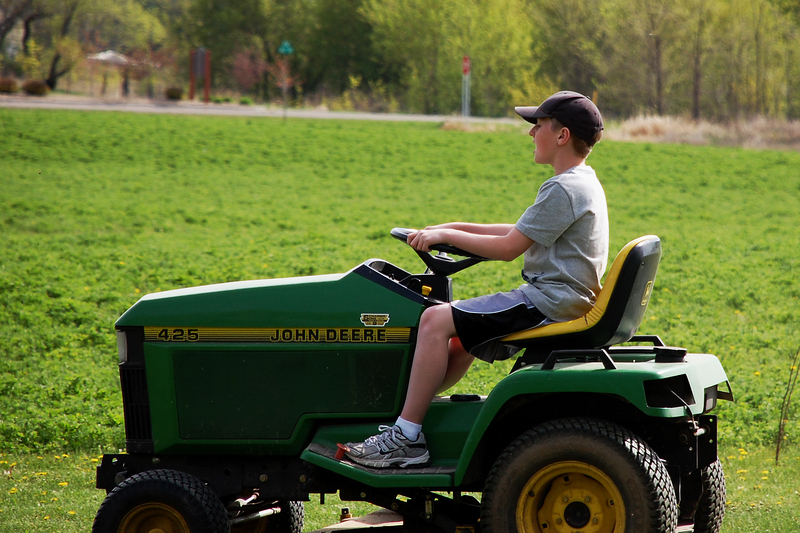 I usually assign the kids different sections to mow over a period of days so that we can all share in the chore. I typically ask our oldest to mow in some of the trickier areas that involve going around trees. Our daughter mows the hill behind the barn and the area around the garden. The newest to mowing, our youngest, mows the meadow areas that only require him to go around and around until the job is done. For most of us, this might seem like a boring task. But not for my sweet youngest child. He takes this job very seriously and does it with great enthusiasm. My favorite part is that he sings. Yes, he sings. Earlier this week, I asked him to mow the meadow. 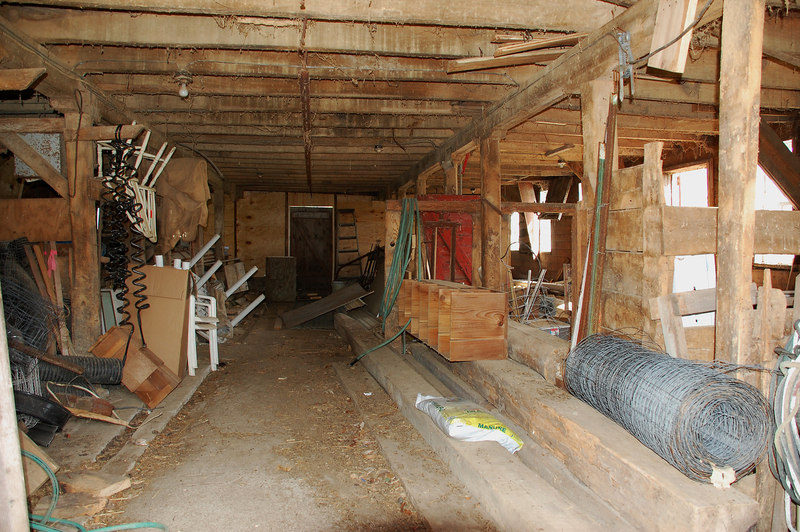 He went to the pole shed, started up the mower, and headed out to start his job. I was out playing in my flower gardens and above the sound of the mower, I could hear him singing. Smiling, I moved closer to hear him (with camera in hand). And the tune? Don’t Stop Believing, by Journey. A classic 80’s song. The woods behind our house is a beautiful sight this time of year, awash in woodland wildflowers. Different varieties of wildflowers carpet large areas and this year they seem particularly abundant. I found a great website to help me put a name to these faces at www.minnesotawildflowers.info. Check it out if you are trying to identify any wildflowers in the northern zones, as they literally have hundreds listed both by color and name. 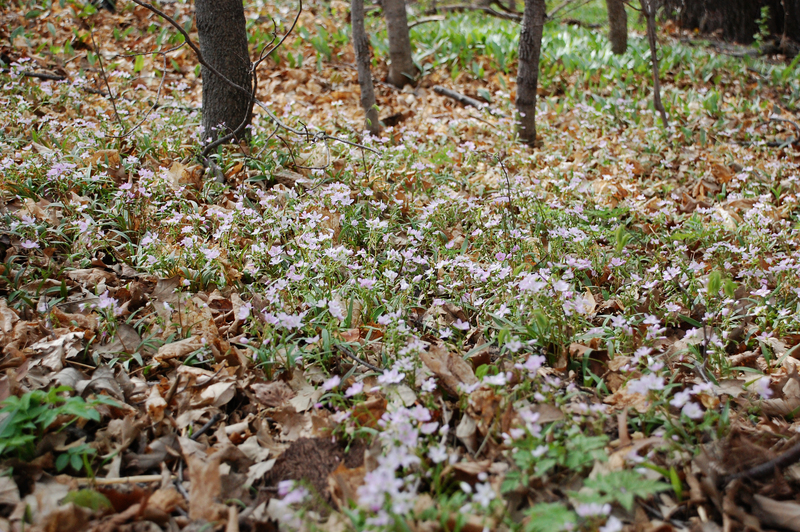 This first pink beauty that is bursting everywhere, is definitely Claytonia virginica, or Virginia Spring Beauty. Our first bump in the road with the bees this season was to lose one of the queens from our two new packages of bees. I went to inspect them last weekend to look for signs that the queens were alive and healthy. Looking for either eggs or bee brood is the best way to determine if a queen is present, other than actually finding the queen (which is not that easy). During our first summer with the bees, I never personally worked the hive. It was always Jesse and one of the kids doing the beekeeping and me standing nearby taking an excessive amount of pictures. So, I have absolutely no experience looking for eggs or brood. But because Jesse is away for work, I was left with no other choice. Anyhow, finding the signs in the second hive was both good news and bad news. It meant that I was capable of finding what I was looking for and that it existed in that hive. The bad news was that it meant the queen in the first hive was dead. For added assurance, I asked our beekeeper mentor and friend, Paul, to come and check that hive too. He confirmed that there was no sign of a queen. It is hard to say what happened to her. She could have been squished when we were shifting frames around or sometimes the bees simply just do not like the new queen and “ball” her, which smothers her. I called our bee supplier and he said he could have a new queen for me in a couple of days. Last night I went and picked her up. I had to drive about 30 miles one way to his residence to get her. As I was driving, it occurred to me how ridiculous it seemed to be driving that far to pick up one bug. Without that one bug, however, the hive is a complete loss. 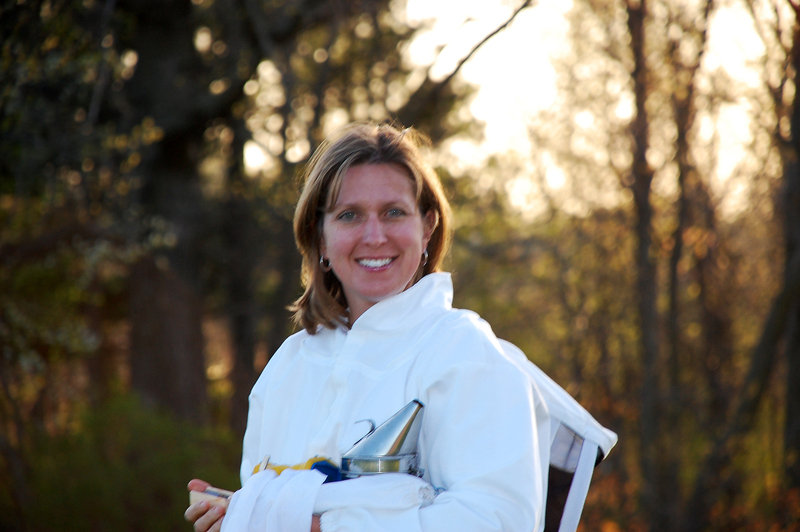 Once I returned home, I suited up and headed out to the hives with our youngest. (He took these pictures, so pardon the blurriness 🙂 ). My first spear of asparagus for the season! I picked the tall one and brought it in the house, cooked it up, and ate it with my dinner. This was the only hill that has emerged so far. I’m not sure when I harvested my first asparagus last year, but I know it was not this early. But spring this year has been wonderful for gardens due to the mild weather and abundant sunshine. After cutting back the old growth from last season about a week ago, we gently tilled around the hills of asparagus to reduce some of the weeds. 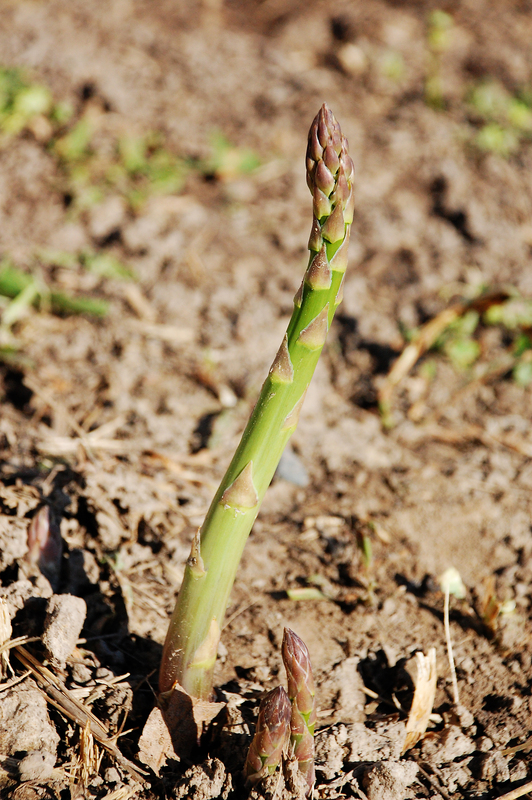 Each spring we top dress the asparagus with compost and fertilize it lightly. The warm days and sunshine heat the soil up once it is uncovered and the spears start to push through. Last winter we lost a few hills of asparagus that we replaced. We are hoping that they all made it this year, but it is too early to tell. A few weeks ago, on March 31st, I also planted my first vegetable seeds of the season – spinach and a mild mesculum mix. This was a full two weeks earlier than in 2009. At the beginning of this week, I noticed the seeds have already sprouted. We should be enjoying some fresh salads with baby greens in a few weeks! 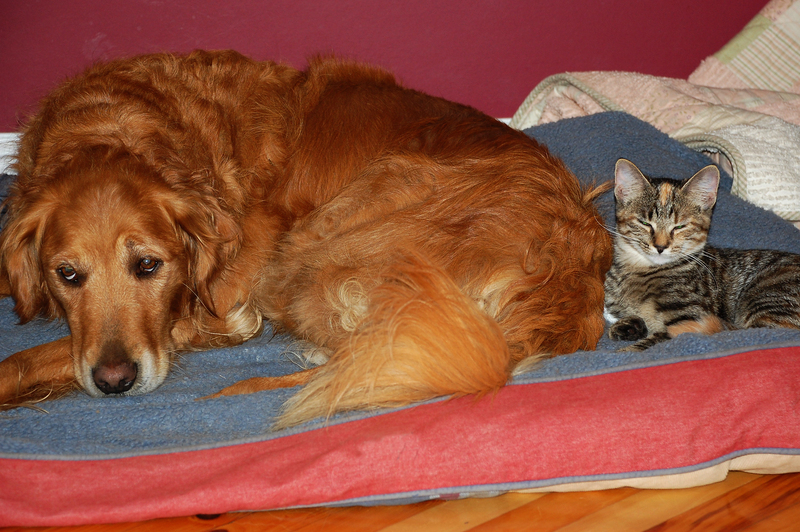 Our dog Sofie and our younger cat Nina have what I would describe as a “delicate” relationship. At times, they seem to be the best of friends. Nina feels comfortable enough to come and settle in next to Sofie on her bed in the evening. Sofie, albeit grudgingly, allows her to share the space. Nina seems to have no fear of the dog. Sometimes when they are outdoors, the cat will jump out from behind something and attack the dog. And Sofie is usually very patient and even playful with Nina in return. But sometimes things change quickly from playing to getting a little rough. We have a winding river that runs through our property. 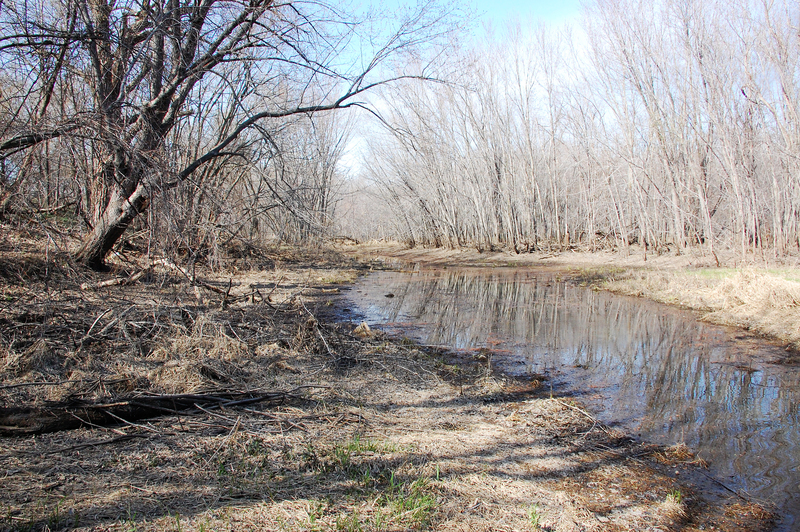 During the spring thaw, it usually floods for at least a few weeks. If there are heavy periods of rain in the summer months we often get additional flooding. In addition to the main river, much of our property is lowland, what we call the “river bottom.” It is swampy and marshy most of the year. Beginning some time in May, the mosquitoes hatch and it becomes quite unbearable down by the river. As the summer progresses, however, and we experience drier weather, the mosquito population subsides and the backwater (below) recedes enough so that we are able to cross it and go out to the point where the river and backwater meet. We still have to put down some type of lumber as a “bridge” to walk across the water and muck of the backwater. In past years, we have only went down to the river on a few hot summer days to take a dip in the river and maybe have a picnic. Totally overgrown with grass, we would just stomp down an area on the point and throw down our blanket to sit.